In 1959, in Oakland CA, record producer Bob Geddins was putting the finishing touches on his recording studio. I was seated on the floor with my back against the wall soaking up all I could about the recording business. Suddenly the front door flew open and in bounced an attractive young lady with flowing black hair lugging what looked like a small suitcase, but in fact was a tape recorder. This was the first time I had laid eyes on Sugar Pie DeSanto. Behind her was a little skinny guy, Pee Wee Kingsley, her first husband. Sugar Pie excitedly shouted out to Geddins, ”Bob, I think I got one.” Bob, in his slow, Texas drawl said, “Pluggg it innn and lemme hearrrr it.” After listening, Bob said, “We’re gonnnna cuttt dis suckerrr tonightttt! !” I was there when she recorded her first hit, “I Want To Know.” The recording sounded the same as it did when Sugar Pie brought it in that day, but when it was released, instead of Sugar Pie and Pee Wee getting credit for writing, the credits read: Geddins, Badger and DeSanto. So between the time she brought it into the studio and the time it was released, two-thirds of her writing royalties vanished. You can learn more about this in my upcoming book “The Throw-away People”. Clockwise from left: Promotional Sugar Pie DeSanto photo by Gilles Petard, 1960; advertisement from Billboard Magazine, July 1960; vinyl label from the 1960 “I Want To Know” single on Veltone Records. 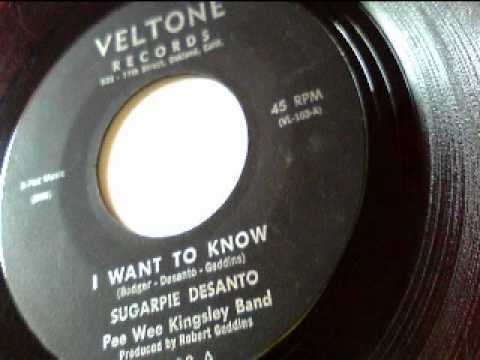 Click the video above to listen to “I Want To Know” by Sugar Pie DeSanto on Veltone Records.